ExAM includes tools to make it easy to go from questions, to customer feedback, survey or data calls to insight. Use the Assessment Template Builder to rapidly develop your feedback instrument…configure look and feel, set up scoring, field mapping and any case management rules you need. 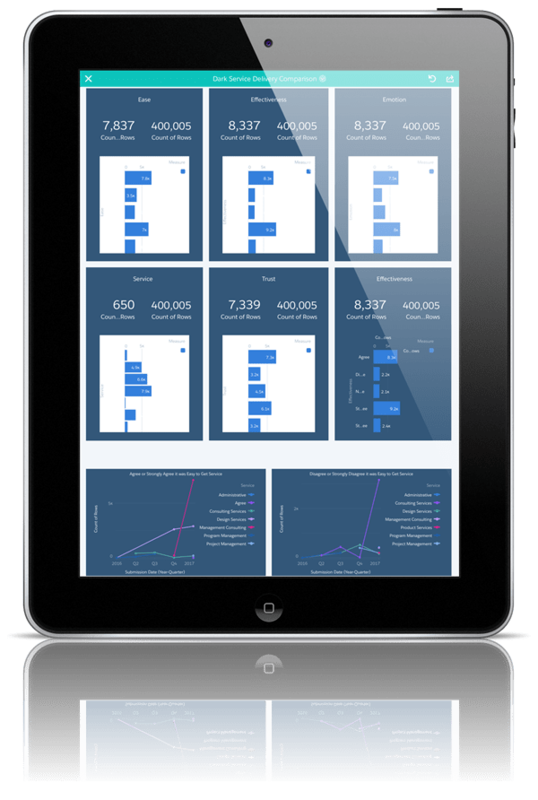 Then distribute and start getting getting results in real time with Salesforce standard dashboards and reports or take it to the next level with Wave Analytics. 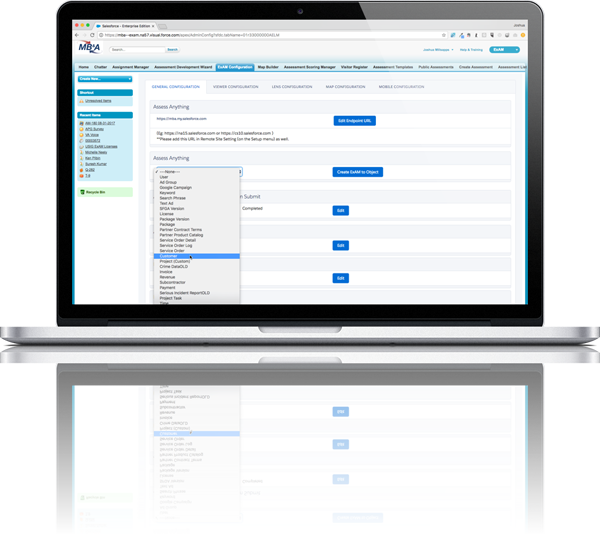 The ExAM Command Console provides users with a streamlined lightning experience to walk through the process of creating assessments, sections templates, question templates, as well as providing you will valuable analytics to accompany the public assessment without all the hassle of having to create reports to see this information. Even better…the ExAM Command Console is only going to get better as we roll more and more ExAM features into this single page and easy to use interface. Assess Anything is a vital piece of what makes ExAM so powerful! Assess Anything allows you to gather feedback, data calls, and form data directly against your Salesforce objects. Utilizing Assess Anything you are able to expose Accounts, Cases, Leads as assessable, infact, all Salesforce standard and custom objects become available as assessable. This allows you to leverage the data you collect directly to these objects. Set up Assess Anything against any object in Salesforce in one click! Use ExAM Field Mapping to seamlessly deliver insights directly from the customer to your Salesforce Org. Map their answers into your fields or score their answers and map the scores. You are then able to use scoring and field values to drive workflows or develop consolidation objects that make Wave Analytics a snap and valuable business insight happen in real time. ExAM Field Mapping is game-changing in its ability to help you develop real-time data collection Apps. See how easy field mapping is with ExAM! Assessment template scoring allow you to provide you assessment with complex or simple values to provide you with metrics to gauge the responses that you recieve. Utilizing scoring you are able collect valuable data or drive important workflows. This feature is robust enough that the only thing limiting you is your ability to come up with new and complex ways to utilize it. Check out an example of how assessment template scoring can be use! Decision trees within ExAM allow you to create a complex interlinked assessment with questions relating to specific answers and so on. 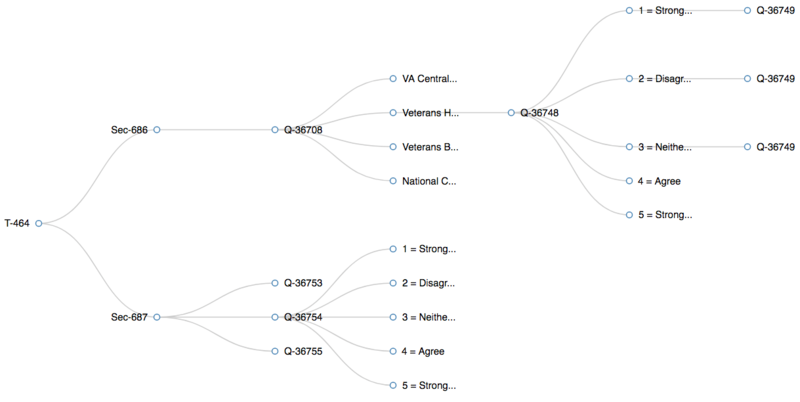 Utilizing decision trees can help streamline the end users experience while also providing you with the ability to collect robust data. ExAM provides you with the necessary tools to simplify the process of implementing decision trees in your assessments. Check out the how to configure an example of a decision tree implementation and the tools to assist in implementations! 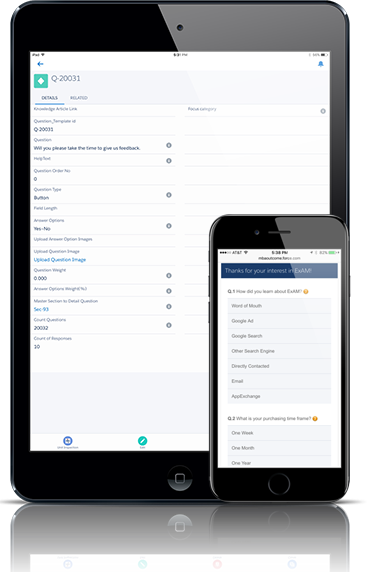 Assess Anything lets you gather feedback, data calls, and form data directly against your Salesforce objects. Accounts, Cases, Leads, in fact, all Salesforce standard and custom objects. Set up Assess Anything against any object in Salesforce in one click! Click here to learn more! Ask a question and select the question you want to ask next based on their answer. We have surveys pulling from banks of more than a thousand questions where most people never answer more than 10-15. Click here to learn more! Create and save reports based on ExAM Objects. Report Builder makes it easier to generate good-looking reports in pdf, HTML, even JSON. 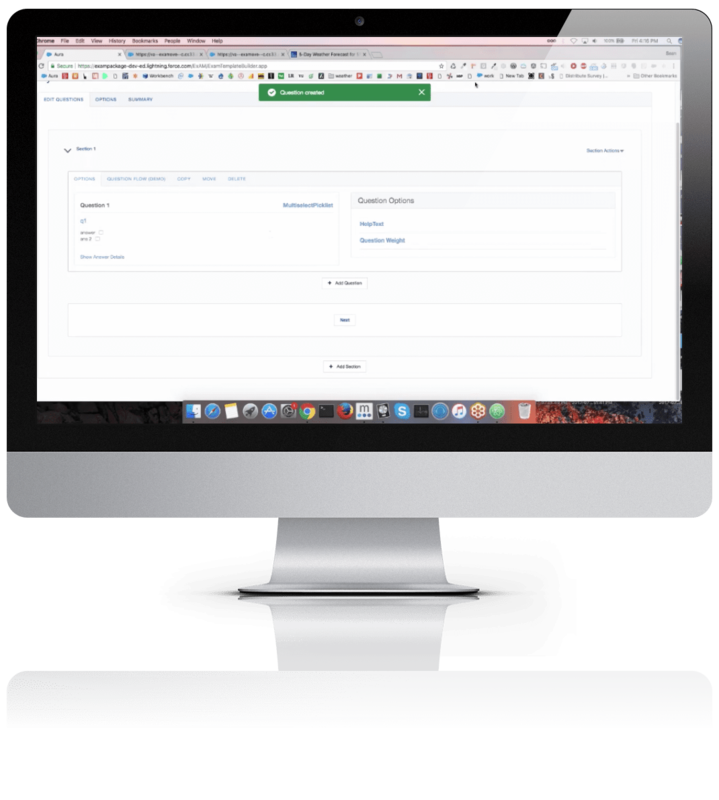 Customize headers and footers and include data off all of your accessible Salesforce standard and custom objects. Click here to learn more! Viewers support the user experience for the people filling out surveys, entering forms and providing feedback. ExAM includes viewers that provide heavily configurable data entry tools designed to make getting and giving information easy for both the end user and your team. ExAM gives you instant insight into your case management end-user satisfaction. Send different email templates and surveys based on Case criteria and get real insight. Click here to learn more! For any survey or data call set up a Watchlist of Words so that anytime an end user enters a particular word or combination of words in any answer a case is created. We write the Watchlist Word to the case subject which can be used to drive further workflows. Click here to learn more! Move data out of your forms and feedback directly into any Assessable Object (any Standard or Custom object). 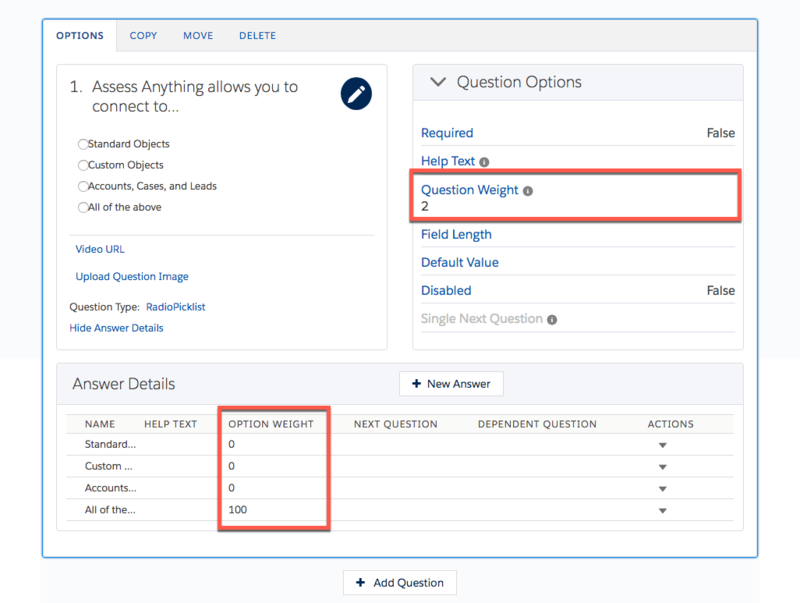 Move answers to questions and individual scores directly into fields you specify on the Assessable Object. Click here to learn more! You can use the simple but powerful template builder to configure the look and feel of your assessments or data call, or you can completely style it with your own custom CSS. Click here to learn more! Because ExAM lets you score every question and answer you can build some pretty elaborate scoring models. You can use these scoring models to determine where your end users land next with score base page forwarding. Set up different process to run based on an ExAMs score on submission. ExAM has more than 18 unique question types including radio picklist, list, button, text, email, phone, number, result, signature, image, video, file, case and more. Score every question, create dependent questions, add mandatory questions and configure other question configuration options easily. Click here to learn more! Plot any Accessible Object (Salesforce standard and customer objects) on a map and use scoring or other fields to update pin color. ExAM integrates with your Google Maps via your API key and gives you instant insight into your location data. ExAM gives you easy to build landing pages and even includes a web intercept builder that generates code you can cut and paste into your website to embed an ExAM stakeholder feedback, survey, lead landing pages or other ExAM based forms. ExAM makes it easy to get the information you need to do your business. Our the Lightning Template Builder helps you build simple and complex forms faster than ever before. Build Customer Feedback forms, Landing Pages, Web to Case, Web to Lead, Surveys and Data Calls in minutes. ExAM is your data gathering Utility Belt and that pretty much makes you Batman! Gather data, auto send customer service surveys from Service Cloud, analyze the results in Wave, and drop it all on a map. No code, just configure and go! Every month we dish out a hot batch of awesome including new features, how to articles, webinar dates and tutorials. Don’t miss out on the latest and greatest! Make sure you get all the latest stuff working in your org and never miss another webinar. Get the ExAM Monthly Release Newsletter. Everybody wants to have their apps go mobile, get customer focused, and provide them with the insights they need to run the business. Many large commercial and federal custom apps are essentially Data Collection + Work Flow + Case Management + Reporting & Analysis. ExAM can take care of the first and has native tools that plug directly into Salesforce’s to cover the rest. Make doing light grants management, complex data calls and other form collection and evaluation tasks easy. Using ExAM to build a great data collection interface can greatly reduce the time required to build a customer-facing front end especially if it needs to touch both internal and external stakeholders. ExAM can help your organization support the really big decisions. The ones that require gathering, managing and assessing information from across organizations, people, and systems, in a repeatable, tweakable fashion. ExAM was developed to make gathering information easy so that you can focus on solving the problem. We help you talk to customers on your website, we respond to the text message about that last service call and we go out in the mail after every case. Every interaction and in fact everything in Salesforce can be tied to ExAM and measured with it. It’s pretty exciting stuff actually. Salesforce lets you build just about anything you can think of on the platform and ExAM lets you measure it, feeds it with information and helps you understand how your customers feel about it. 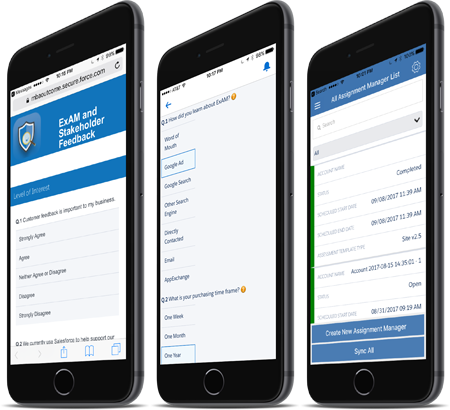 ExAM scores leads and applications, asks you how your helpdesk ticket went and helps us really understand if our customers like our product, our salespeople or our brand. Handle data calls across a broad array of capability areas including IT portfolio management, facilities management, security, capital planning, strategic planning, inventory management, etc. ExAM helps you focus on the important part of the data collection…the content. Need to run a data call to get your IT portfolio up to date? No problem. Map the answers to your questions right to portfolio object records. In ExAM you can create groups of records that you need refreshed by stakeholders on a regular basis. Create a group to handle data calls that happen regularly. Need an update from a stakeholder to a set of records on a regular basis? ExAM can help you handle the type of repetitive data calls that feed the information machine and drive improvement, but that can kill productivity if they are poorly executed. Getting good feedback isn’t easy. Not with so many different ways to communicate. ExAM is all about multi-channel. 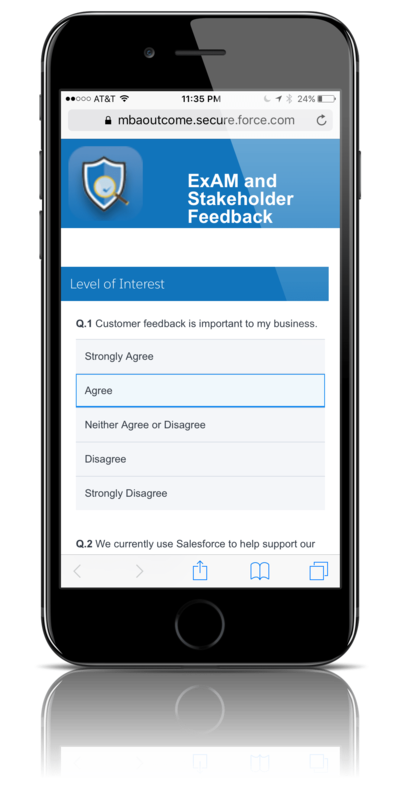 We make sure the questions you need answered look good on mobile, your website, in Salesforce, on Social, via SMS and even in our native iOS and Android shell app. Leverage more than 20 Question Types to get just about anything from signatures to image based questions that help you get just about any type of information you need easier. Make it easy to give you information. Use ExAM. ExAM Viewers help you collect information and they can be configured and tailored in order to meet a broad set of use cases. Need to provide assessments in the field? Security assessments, field inspections, fitness tests, maintenance tests and more can be done in fewer keystrokes with ExAM. Want efficient forms that support modern workflows our ExAM Viewers give you configurability, security and a feature rich capability for helping support really user friendly data collection tools. Touch the public. Provide exceptional customer feedback capabilities across multiple channels and really get to understand your stakeholders. ExAM’s public assessment viewer handles more than 20 question types and can be easily configured to elegantly gather data or be completely absorbed into your look and feel by adding custom css. ExAM’s Standard Viewer sets the standard for easy data collection from inside your Salesforce org. Easily configure a viewer that lets you empower your community members to gather data and provide you with complex interactions tied a completely configurable viewer including tabs for navigating between data collection assignments, navigating between assessable objects, Enable Comments, File Uploads and many other Advanced features. The Lens Viewer handles ExAM’s most complex data collection tasks so you can make them simple for the people who are providing the information. Create complex interrelated data calls via a simple app like interface you that allows you to easily build data collection via form, into work flow, and then on to assignment of a reviewer and data evaluation via form application. THe Lens Viewer is also the basis for the MB&A iOS and Android native apps that support offline data collection. Whether you are collecting polling data in a rural area with spotty wifi, the belly of a convention center or just need to know you can still collect your data our native apps help you take that offline without losing any of the Len’s Viewers power. ExAM can go native if you need it to. Whether its to go offline or just to make a particular data call “that easy.” for a survey or customer feedback team. Simply configure the Lens Viewer and mobile options in ExAM and give your stakeholders a rich native mobile experience.